Vaermina (also spelled Vaernima), also known as Vaernima the Gifter and Weaver of the Panoply is a Daedric Prince whose sphere is the realm of dreams and nightmares, and from whose realm evil omens issue forth. She is seen as one of the "demonic" Daedra, and some have also claimed her sphere ties somehow to torture. Vaermina's plane of Oblivion is Quagmire, which is described as a nightmare realm, where every few minutes reality shifts and becomes ever more horrifying. "A dark castle one moment, a den of ravening beasts the next, a moonlit swamp, a coffin where he was buried alive." 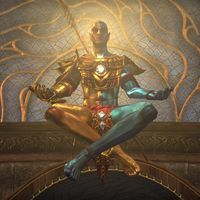 Vivec (also spelled Vivek), or Vehk, Warrior-Poet deity of the Dunmer and "vi" in the Almsivi, was the Guardian God-King of the holy land of Vvardenfell, and ever-vigilant protector from the dark gods of the Red Mountain, the gate to hell. Though some aspects of his past are blurred by time and questions surround some of his more controversial choices, Vivec has always represented the spirit and duality of the Dunmer people, which is reflected in his half-Dunmer, half-Chimer appearance. For hundreds if not thousands of years, he mostly resided at the pinnacle of his Palace in Vivec, his capital, which was visited by hundreds of pilgrims and tourists daily. He honorably guided and protected the Dunmer for thousands of years until his loss of divinity and disappearance near the end of the Third Era, a sacrifice he not only accepted, but helped to bring about. Following his disappearance and the collapse of the Tribunal Temple, he was renamed Saint Vivec by the New Temple and declared a member of the False Tribunal. This page was last modified on 12 July 2014, at 18:03.